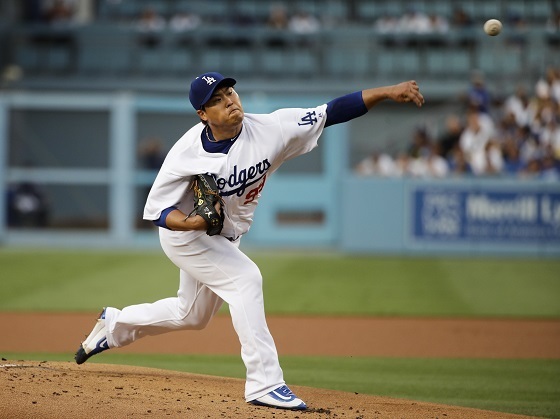 Ryu Hyun-jin continued stating his case for a rotation spot, spinning seven shutout innings in the Los Angeles Dodgers’ 8-0 win over the New York Mets on Sunday. Ryu was nearly perfect in his seven innings of work, striking out eight Mets, including the first four batters he faced. He allowed only one hit, a third-inning Travis d’Arnaud single, and did not issue a walk. He won his first decision since June 17, bringing him to 4-6, while lowering his earned run average to 3.53. Amid talk that he may be relegated to the bullpen due to the Dodgers’ crowded starting rotation, Ryu has overcome his rough start to the season and been on a recent run of ace-level form. His seven scoreless innings Sunday extended his current scoreless innings streak to 15 innings. In his last six starts he has thrown 34 2/3 innings and struck out 38 batters, posting an ERA of just 2.20. Mets starter Steven Matz was bounced from the game in the sixth inning, allowing five runs on six hits and two walks over his 5 1/3 innings pitched. He also took the loss, dropping to 3-4. Dodgers third baseman Justin Turner went 2-for-4 with a double and a home run, increasing his National League-leading batting average to .349. Cody Bellinger also homered for the Dodgers, his 32nd of the year, a two-run shot in the eighth. The Dodgers (79-32) have now won four in a row, and are 17-3 since the All-Star Game break in mid-July. They currently have a commanding 15 1/2-game lead over the second-place Colorado Rockies, and an 8 1/2-game lead over the Houston Astros for the best record in Major League Baseball. The Dodgers are on pace to win 115 games, and have an outside chance of topping the MLB record of 116 wins, set by the Seattle Mariners in 2001.